A Climber Reaches The Top Of A Snowy Mountain. Concept: Courage, Success, Perseverance, Effort, Self-realization. 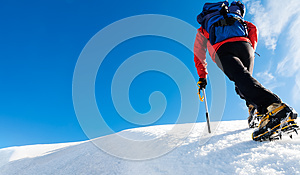 Photo title: A climber reaches the top of a snowy mountain. Concept: courage, success, perseverance, effort, self-realization.